Baby chicks are 9 days old to day. Gave them some meal worms; stolen from the peacock ration. The game was on. I don't know why anyone would watch football when you can give baby chicks a meal worm. There is running, interceptions, and tackles. Fast action! After they had the meal worms (which are from a Bird store, so no parasites) I began to wonder if it is all right for them to have meal worms? Well, all are alive and very fiesty, so I am going to assume that they are fine. 58 degrees last night outside (weird or what?). Closed the peafowls up and shut the windows. No light.....should I get one for them? I am going to break down and just buy a peafowl book!! Today, a grasshopper found its way into the brooder....via my husband AGAIN! It was alot of fun and racket! Finally I pulled what was left of the grasshopper from the babies because I have not given them any grit. However, since treats seem to keep finding their way into the brooder, I am going to add some to the baby crumbles just in case! Chicks are all really trying to fly....not just the Dominiques! 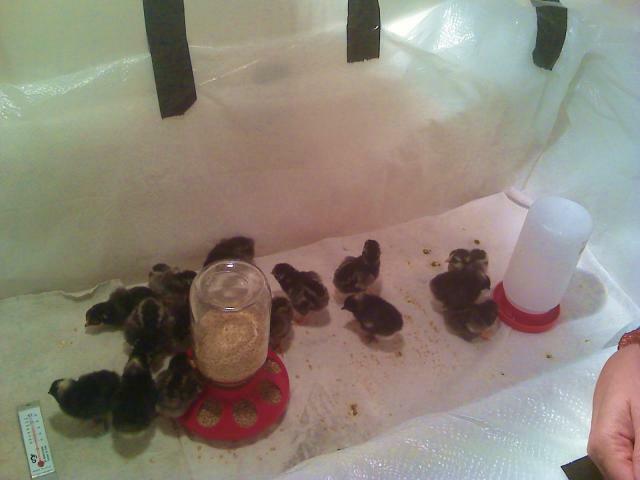 It appears that soon they will have to be moved to the outside brooder. I can not believe that I am going to say this-but....I am really going to miss them and I won't be able to go outside nearly as much to play with them. Yesterday...I had a bad day! I never would have guessed that coming home to my baby chicks would actually help! They are now flying up into my lap and making little singing sounds! They are going to have to go outside to the hen house soon and I am going to miss them. Last night, I had 3 babies at a time flying up into my hands. I told my husband..."This is very neat....probably won't be when they each weight 6 or 7 pounds!" 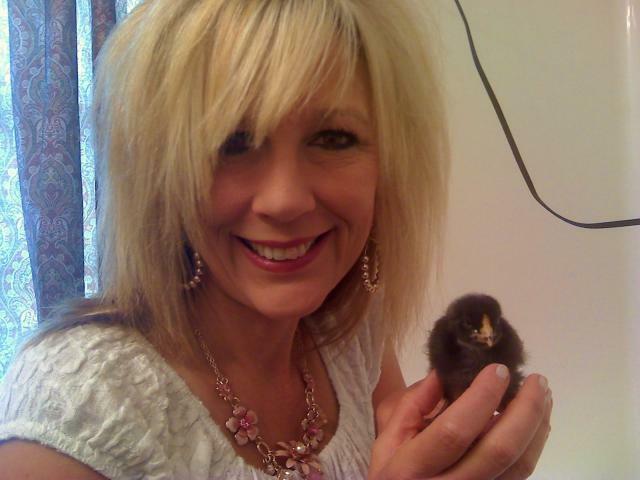 Baby Chicks 2nd week birthday--Today! 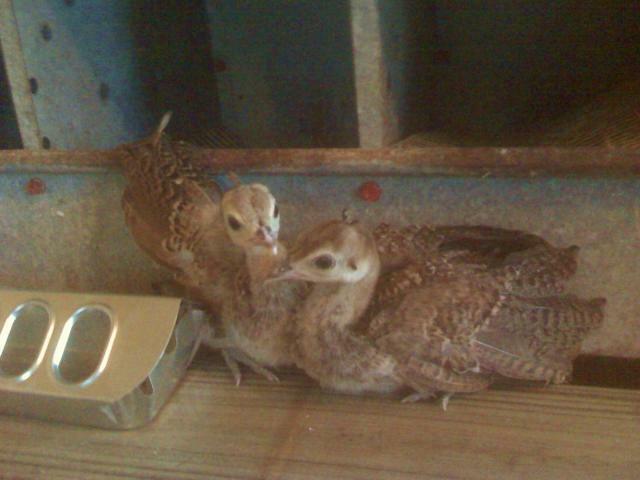 They have tripled in size, have lots of little feathers and have moved up to a perch in their brooder! Clearly my husband and I need grandchildren.....we are getting way to attached to these chickens.........I still can't really tell any one individual apart. So maybe I am not too far gone over the edge! 4 weeks old today! What fun we are having. They are now in the hen house brooder. Which is good; I really love them but let's face it, they poop....ALOT! 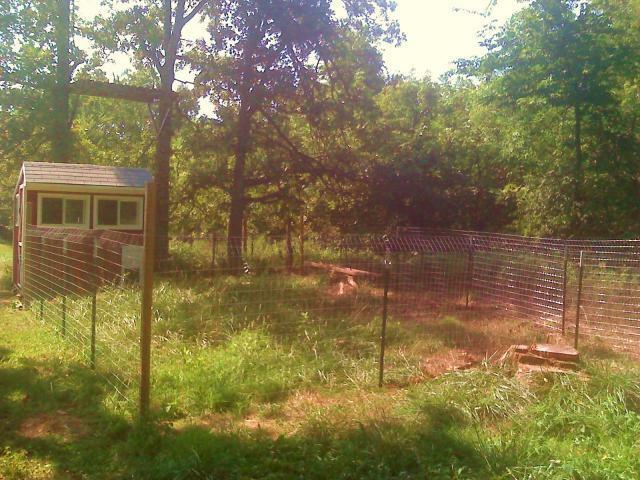 Monday took them out into the yard in the chicken playpen my husband made me. Their first foray into the grass! Much bug hunting and running about. When I put them away in their nice clean brooder, they were like little kids; very sleepy from much playing. One little chickie is starting to worry me though. Much taller than the other and all ready getting a bright red comb and wattles....Did a baby rooster sneak in? We shall have to wait and see!